Just yesterday, BioWare did a Twitter Anthem Q&A wherein the developers answered almost every fan question thrown their way. Taking part in the Q&A were Executive Producer Mark Darrah, Head of Live Services Chad Robertson, and Producer Ben Irving. If you think wading through endless strings of tweets is not an efficient use of your time, we agree. Fortunately for us, Reddit user bepeacock has listed every answer all three BioWare devs gave and you can read ’em below! No ability to do strongholds solo. They are constantly adjusting the economy to earn cosmetics in a reasonable amount of time. They are looking into not interrupting javelin startup animation. They are looking into spectator cam while downed, but not for launch. Swappable melee weapons not available at launch. Freeplay will not be increased to the same number of players as launch bay. They are looking into adding waypoints after launch. Will not be able to change visor colors at launch. No photo mode at launch but acknowledged this is widely requested. Cosmetics include armors, emotes, banners, vinyls, and a few more things in development. No comment on more javelins at this time. Mass salvage option available in vault. Loot tables are biased toward the javelin you are wearing. Story missions do not require matchmaking. Iron Man skins would require a deal with Disney. Companions are not being considered for Anthem. Console players will have look inversion. Pilot character customization will be limited to a pre-generated list. The inherent nature of the game means PS4 Plus and Xbox Live are required. Choose your pilot’s look only at the beginning of the game. Cannot switch between 1st and 3rd person. Demo players do not keep gear. Romances not being added at this time. There is dynamic time of day in game. Helena Tarsis’ javelin predated Colossus so that doesn’t necessarily mean Colossus gets a sword. If you want to be thicc boi like Colossus, do 100 pushups, 100 situps, 100 squats, and run 10K. Story missions will all have matchmaking option. More open world activities will be added over time. Visor, thruster, shield, and dagger colors are being looked into. There have been may balance changes since the demo fork. You’ll be able to choose the launch bay or Fort Tarsis after an expedition. Loads will be faster on launch than in the demo. There is not a hard ending with credits. The story will be continuous and evolving. Sponsored/branded or event vinyls will likely be part of the game. Freeplay will not have a private session option. AoE attacks will harm the cute Grabbits. That’s the way it is. Save files can be carried over to next gen consoles. Drivers will be available for PC gamers to use PS4 controllers but it is not natively supported. They want to add more javelins in the future. Anthem will continue growing for years. Cataclysms are the aspiration content for teams, challenges, and top rewards. Plan on adding statistics to post expedition screen after launch. No locking equipment to prevent accidental deletion beyond the equipment equipped. Sprint speed increased in Ft. Tarsis, along with movement responsiveness and camera improvements. The issue in a stronghold when someone left with an objective (echo) and it stopped the team’s progress has been resolved. Photo mode and weapon customization will not be added in the short term. Rather than a “vote kick”, they are working on improving their AFK timers. Count on “raid level” content in the first year of the game. Teased the possibility of choosing ultimates down the line someday. Invites can be sent in game (but didn’t really say if “join squad” would be an option). They are looking into other achievables like titles. Not looking at increasing freeplay squad more than 4 in the short term. A healer javelin is not likely because they focus on flexibility. You can uninstall the demo without fear of not getting your rewards for playing. No loot boxes for cosmetics. Guilds will not have a private social space at the launch of guilds. Some activities will only be available for a set time but could come back around. There are no plans to allow loadout change in the field. Cannot upgrade weapons, you’ll have to get another one. Bosses will not have unique drops at launch. Cataclysms will be aspirational, meaningful, challenging, and the place to earn the best rewards. Patch notes will only be for changes made after Feb. 15. If you get booted from an activity, you’ll get all the XP and loot up to that point. No elemental weapons or bullets at launch. May add later but they won’t do combos. Vinyl colors cannot be changed. Javelins will not favor a gender in appearance. No weapons beyond legendary at launch. Setting up primer and detonators are all about your team make up and the difficulty of the content. In other Anthem news, go check out this cheat sheet for all the javelins’ powers, and what playstyle they’re capable of and more. 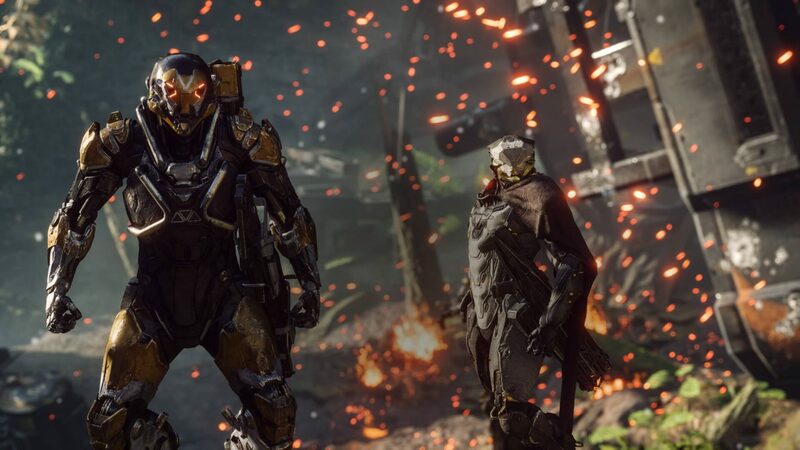 BioWare has also shared a quick preview of what the Anthem endgame looks like which you might want to check out.